The International Space Station as it appears today. This image was taken during a 2010 space shuttle mission. The station has been under construction since 1998. This story was updated at 12:28 a.m. ET. 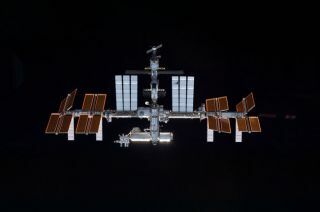 After a two-day orbital chase, NASA's shuttle Endeavour is closing in on the International Space Station and poised to make its final visit to the orbiting lab early today (May 18) before hanging up its wings. "We're looking forward to being back at the space station," LeRoy Cain, head of Endeavour's mission management team, said in a news briefing Tuesday (May 17). "This is an extremely important mission for us." Upon their arrival, shuttle commander Mark Kelly, pilot Greg Johnson, and mission specialists Michael Fincke, Andrew Feustel, Greg Chamitoff, and Italian astronaut Roberto Vittori, will join the six crewmembers living on the space station, doubling the outpost's population. "Yoo Hoo house-guests!" station astronaut Ron Garan of NASA said Tuesday via Twitter, in anticipation of Endeavour's arrival. Endeavour's crew, which is working an overnight schedule, started the day with the wake-up song "Drops of Jupiter" by the band Train, a tune selected for Johnson by his family and radioed up to the shuttle by Mission Control. "I love that song and I love being in space," Johnson radioed Mission Control. Johnson thanked his teenage son Matt for choosing the song and apologized for missing his birthday, which is tomorrow. "And I want to say that's a perfect way to start an exciting rendezvous day!" Johnson and Kelly will guide Endeavour through a series of crew of engine burns over the next few hours to put their spaceship in position to link up to the orbiting laboratory. During their stay, Kelly and his crewmates will deliver and install a sophisticated, $2 billion astrophysics experiment called the Alpha Magnetic Spectrometer, which will hunt for dark matter, cosmic rays and antimatter galaxies. Endeavour is also hauling up a host of supplies to help outfit the station for its future years. Endeavour's astronauts wrapped up an extensive survey of the shuttle's heat shield on Tuesday. Images and video from the inspection was relayed to Mission Control in Houston for engineering review, but an early analysis suggests that the orbiter did not suffer any significant damage during its launch and ascent into orbit, Cain said. "Preliminary assessment is it looks really good so far," he said. "We're not tracking any issues as far as that's concerned." Part of Endeavour's pre-docking procedure involves a slow back flip beneath the space station. This Rotational Pitch Maneuver, or RPM, is scheduled to begin at around 4:46 a.m. EDT (0846 GMT). The shuttle's pre-docking flip is one of three separate heat shield inspections built into every shuttle mission. This allows astronauts inside the station to take high-resolution photographs of the orbiter for further analysis by engineers on the ground. These photographs will be used to assess the health of the tiles on Endeavour's underbelly, mission managers said. You can follow SPACE.com Staff Writer Denise Chow on Twitter @denisechow. Visit SPACE.com for complete coverage of Endeavour's final mission STS-134 or follow us @Spacedotcom and on Facebook.